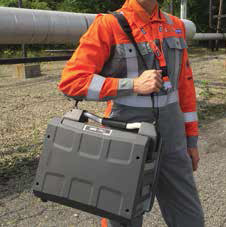 The HPX-PRO is the smallest, lightest CR system designed specifically for NDT use. Weighing in at just 35 lbs (16 kg) and with a less than a 12-inch width (31cm) can be hand-held with ease. The HPX-PRO is designed for portable industrial applications, from ergonomically engineered handles to the shock- and vibration-resistant engineering. 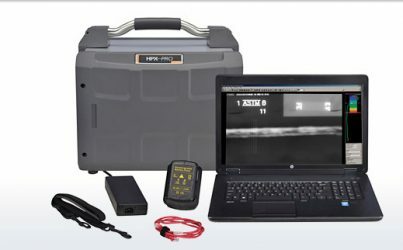 It enables technicians to take Computed Radiography to the next level – anywhere they work – without compromising image resolution, sensitivity, or dynamic range. Finding power in remote locations can be a challenge, but not with the HPX-PRO. It can be operated off main power (110/220v) or by using a common 24V power tool battery. At the core of the HPX-PRO is Carestream’s INDUSTREX Software with a new simplified user interface designed to allow for quick job set-up. Unlike the time-consuming job preparation using conventional film, with the HPX-PRO prepare for your workday in minutes instead of hours. Filter Carestream’s EDGE image filter offers users a choice of display filters while never modifying the original source image. Image can be sharpened or enhanced with gray scale equalization. Weight 35 lbs (16 kg).